Kyūbi brings an exotic high-end dining experience to the heart of Sydney’s suburban south west. A blank canvas devoid of natural light begged for a captivating design response; a dramatic entrance evoking pre-theatre excitement, flows into a rich sensory journey of contemporary Asian opulence and ambience. 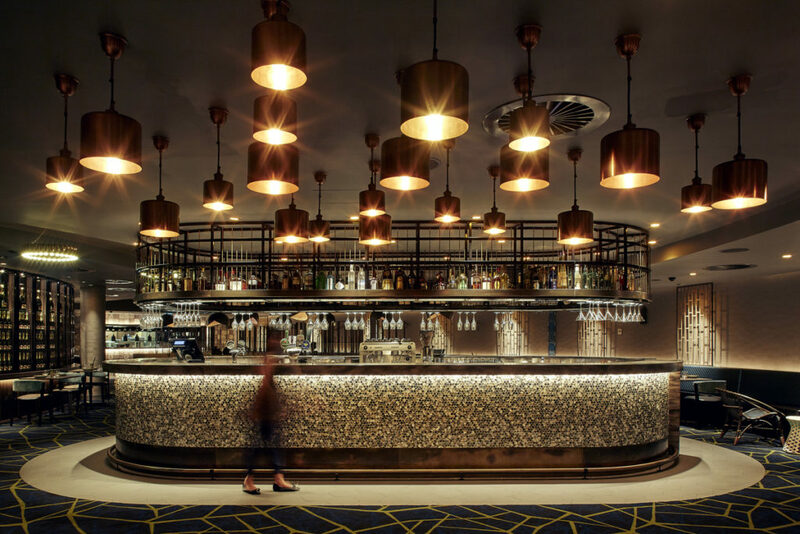 Seeking a unique market offering, Scott Carver were engaged to transform an administration office into a high-end Asian fusion restaurant and lounge bar, providing an alternative destination to Sydney’s CBD. Representative of the renewed focus on the guest experience in Registered Clubs, Kyubi is symbolic of the deep collaboration between food and design, detailing a design response that is both contemporary and captivating. With a menu drawing upon traditional flavours from across Southeast Asia, the focus was to create a rich sensory journey, without targeting a specific culture. The experience of discovery begins upon entry through a dramatic foyer and bronze glass doors. Guests are then met with a lounge and cocktail bar reflecting a luxurious and relaxed mood, followed by intimately curved booths, flexible banquette seating and an open kitchen, combining to create an opulent and exotic experience, with a 5-star hotel edge. Balancing the theatrics desired by the client, with a fine dining ambience, was explored through the curvature of the space, informing the overall design and detailing, but allowing for flexibility of experience. The central cocktail bar separates the lounge and dining areas, while custom seating options cater to a broad demographic. A solution was realised through visual windows around the curved form and curated lighting, in collaboration with lighting designers, Malaya Blonde. Working within a completely internal space without access to natural light presented a unique challenge, as did the broad demographic. Kyubi Modern Asian Dining at the Campbelltown Catholic Club represents a deep collaboration between food and design; particularly as the menu draws upon traditional Asian flavours from a range of South-East Asian countries, and demanded a design response that was both contemporary and distinctive. 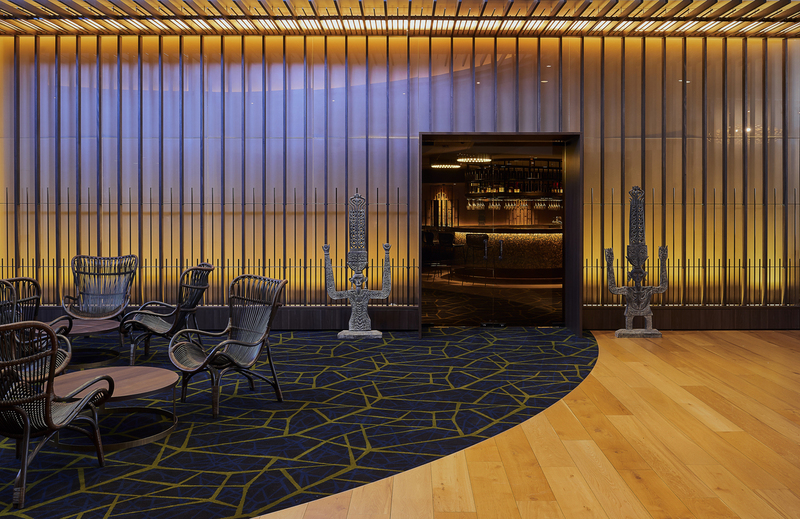 Hospitality design is all about taking people on an experience, allowing them to be engaged and captivated by a space. 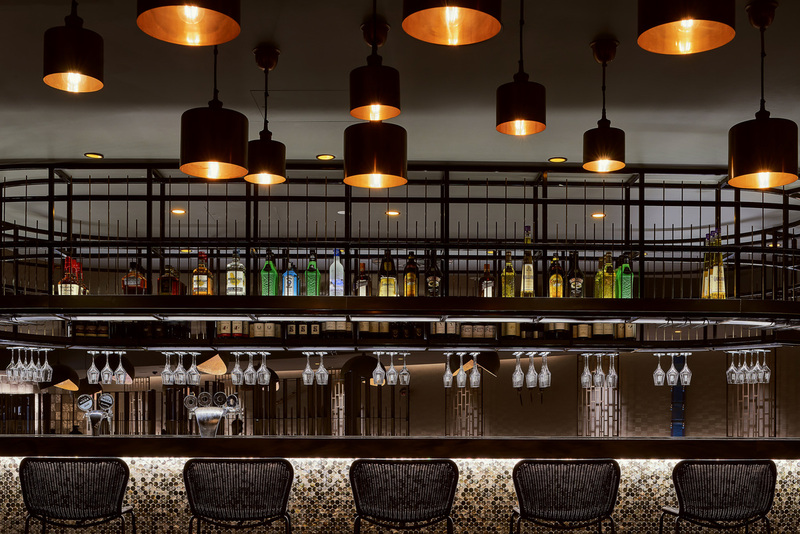 The experience of discovery at Kyubi begins upon entry through a pair of bronze glass doors, revealing a restaurant and bar in an intimate space, while the design avoids obvious thematic references by drawing upon a rich pallet of materials to compliment the flavours of the menu. Custom-made design details include; wine wall, bar, banquette seating, booth seating, entrance screen and host desk. Hand-picked and carefully curated selection of antique artefacts. The restaurant details a regal colour palette of teal, navy and green, tying in harmoniously with the warm timbers, antique brass and leather finishes, acting in contrast to the delicate colours of the wall and ceiling paper. Original artefacts feature throughout the space to provide authenticity against the custom contemporary design elements. 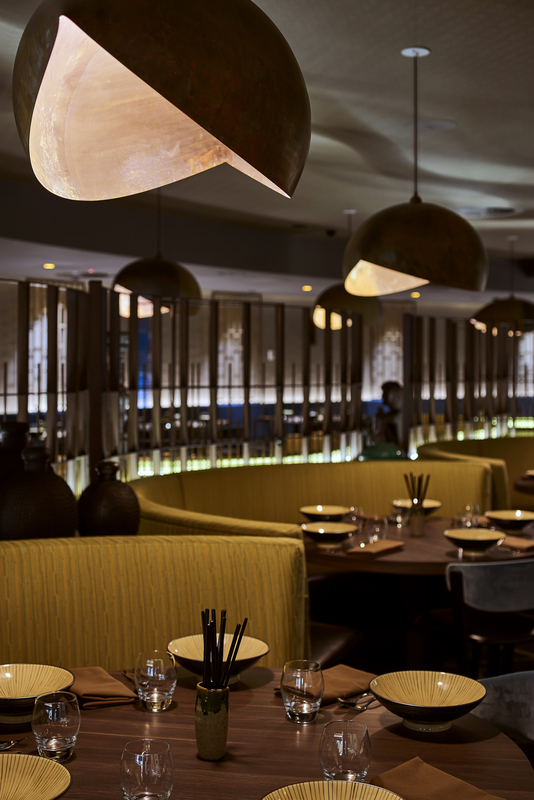 Symbolic of the deep collaboration between food and design, Kyubi’s menu and decor is a modern interpretation of South East Asian culture; drawing upon traditional flavours and elements without explicitly targeting a specific culture. An example demonstrated in the addition of fortune-cookie inspired feature pendants, bringing a touch of wit and eastern character to the design. 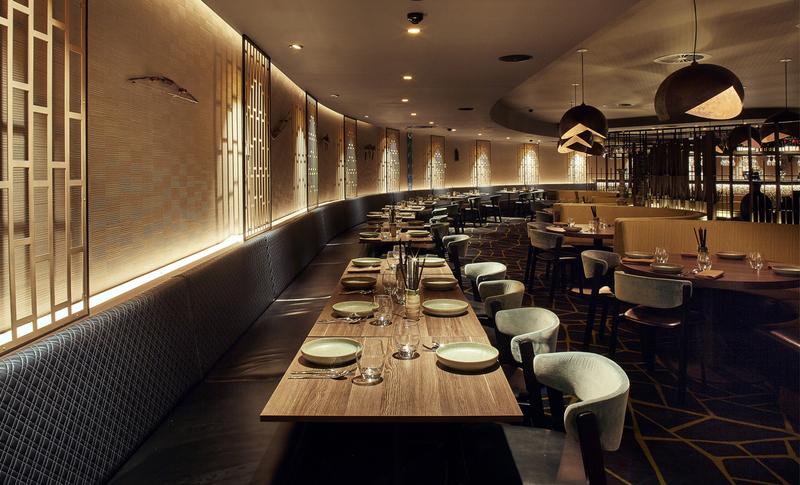 Much like the design, each dish aspires to blend traditional Asian elements with a twist of modern execution; while original feature artefacts provide an authenticity against custom contemporary design elements. 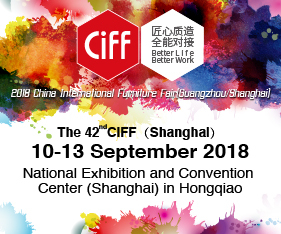 Posted in Architecture & Design and tagged architecture, australia, business, design, furnishing international, furniture, home, homewares, industry, industry news, interior design, interiors, NSW, Scott Carver, sydney. Bookmark the permalink.